Slightly less preachy than Vol. 1, this anti-war saga of the '60s continues with a good balance of the cartoony and the serious. 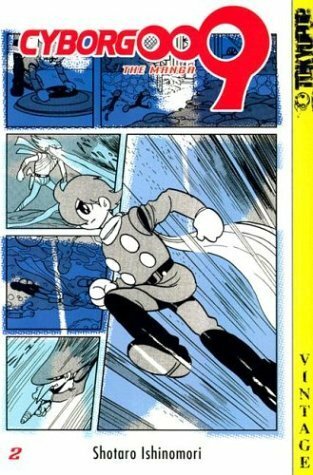 What Tezuka did for robots in his Astro Boy series, Ishinomori does here for cyborgs. His creativity is particularly enjoyable in the chapter "Man-Eating Mansion." I'm hoping in vain that that won't be the last I see of 0012. I'm hoping Vol. 3 and 0013 are equally intriguing. Wow, this series keeps getting better and better. It really gives us a look into who 009 was and each of thier personalities. They're protective of 003, they're genuinely good people. But that doesn't mean their not willing to do what it takes to get the job done. They don't want to kill, but if they have to they will. These books are pretty fascinating... it's really interesting to see Ishinomori using manga as a medium for his anti-war message. I also really enjoy the old-school artwork, and the story is fast-paced. Overall an enjoyable installment and a good continuation to the first volume as we learn more about the cyborgs and the organization responsible for their creation.